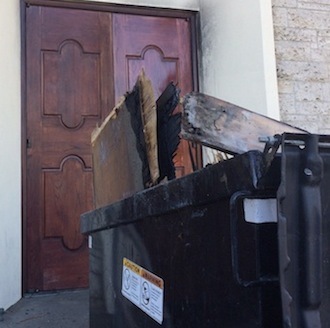 LOS ANGELES (CNS) – A 25-year-old man arrested in connection with a series of arson fires and vandalism targeting houses of worship throughout Southern California, most recently in Boyle Heights, was being held in lieu of $75,000 bail Saturday. The Inter-Agency House of Worship Task Force arrested Christian Michael Garcia on Thursday on suspicion of arson and vandalism. Garcia was booked at 7:20 p.m. Friday into the Los Angeles Police Department Valley Jail in Van Nuys, according to online inmate records. Read about communication reaction in this story . The case against Garcia will be presented to the Los Angeles County District Attorney’s Office on Monday for prosecution, authorities said. “Arson and vandalism targeting houses of worship is a serious crime and we have zero tolerance for willful acts of destruction in the city of Los Angeles,” LAPD Chief Charlie Beck and LAFD Chief Ralph Terrazas said in a joint statement. The most recent incidents involved an incendiary fire and vandalism at Resurrection Church on Thursday in Boyle Heights and the Church of the Angels in Pasadena on Jan. 13. Authorities say Garcia is also connected to multiple other acts of arson and vandalism that have occurred at houses of worship in Los Angeles County. Thursday’s fire was reported at 2:05 a.m. at the church on the 3300 block of East Opal Street. It took about 60 firefighters nearly 30 minutes to extinguish the fire, which burned primarily on the first floor. The flames were kept from the main sanctuary, said Los Angeles Fire Department Capt. Erik Scott. 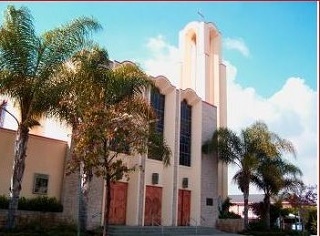 The Pasadena fire at Church of the Angels broke out at 2:20 a.m. Jan. 13 at 1100 N. Avenue 64. The blaze at the 129-year-old Episcopalian church was classified as a hate crime, according to Lisa Dederian of the Pasadena Fire Department. A few historic statues were “significantly damaged,” and there was fire and smoke damage inside the church, she said. Pasadena Police Chief Philip Sanchez said in a joint statement.